The House Over-By is a comfortable place to relax and stay overnight, right next-door to The Restaurant. If you decide to stay with us, a table for Dinner in the Restaurant will be reserved for you automatically. 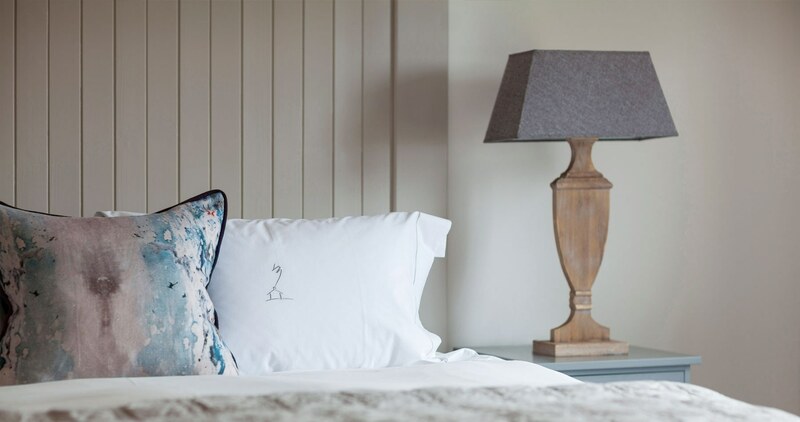 Each of the six beautifully appointed, junior bedroom suites features a stunning sea view and direct access to our garden with its pathway to the seashore. This is a romantic retreat to escape for a perfect break, or to celebrate a special occasion. Fully serviced by our professional staff, we pride ourselves in a high standard of housekeeping and attention to detail. We have six luxury bedroom suites, very spacious and comfortably furnished with sumptuous, six-foot wide, king-size beds. Each has an en-suite bathroom with a large, double-ended bath tub and power shower. A selection of Temple Spa toiletries, warm bath towels, bathrobes, slippers and other pampering products are all provided, including a hair dryer. Each room is equipped with an iron and ironing board. All the rooms are on the ground floor with easy accessibility across the courtyard to the restaurant. Five are split-level, with three steps dividing the bedroom from the sitting room area. The sixth is on one level, with a larger bathroom and separate walk-in shower. This room is also suitable for a wheelchair user, or as a family room. It can be set up with a king-size double, with twin beds, or shared with a third adult using the fully sprung sofa bed. We have a cot and Z-bed available for babies and toddlers. There is no extra charge if they are sharing with their parents. We can offer two rooms adjacent to one another in a private corridor for families wishing to be near each other. In-room facilities include a multi-channel, flat-screen TV, DVD player and a Bose Bluetooth Speaker. Direct dial telephone is available in each room and we make no charge for local UK calls. Free Wi-Fi is accessible throughout the building. There is a well-stocked mini-bar, tea kettle and coffee machine. Complimentary fresh fruit, home-baking, fresh milk and mineral water are provided. A selection of DVDs, books and games, is available for guests’ use during their stay. Safe, private parking is provided immediately outside The House Over-By.